The Burton Felix Step On Boots have a medium to stiff flex with a nice speed lace type boa that is fast and easy to tighten. 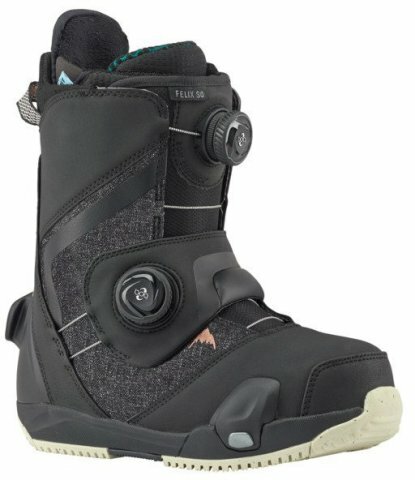 It has a built-in ankle strap that gives extra support on the boot since the Step On bindings don’t have an ankle strap. I found the boots very responsive and pretty comfortable. I did get a little pressure on the front of my shin when flexing forward, and they weren’t very easy to butter. They have a nice rubber sole and have comfortable liners that should keep you pretty warm on the cold days. Sizing: I’m a true 7.5 in women’s shoes and the Felix boots seemed to fit true to size. My toe was right at the end of the toe box but they were new boots, and when they are broken in I’m sure they will pack out to be the perfect size. Fit: They fit well around the ankle, and seem to be for the average size foot. Comfort: The Felix boots were pretty comfortable. I liked the liner that they come with, I did get some pressure points on the front of my shins when I flexed forward that was a little uncomfortable, and when flexing from side to side doing butters I got a lot of pressure on the side of my leg like the boot didn’t want to flex at all. Flex: I found them to be a medium stiff flex. Turn Initiation: Very quick turning. The Felix boots were very responsive. Shock Absorption: Decent shock absorption, not like riding on clouds but they weren’t bad. Heel Hold: I didn’t have good heel hold for my foot. I was able to lift my heel up way too far for my liking. But I also have very small ankles. Adjustability: Pretty good adjustability. You can custom turn the boa to exactly where you want it. The inner liner adjustability was average. Traction: They have a nice rubber sole, and the traction seemed to be good. On & Off Ease: Pretty simple to take on and off. The boa system makes it easy. We try to get as many images of the Burton Felix Step On, but forgive us if they're not all there.